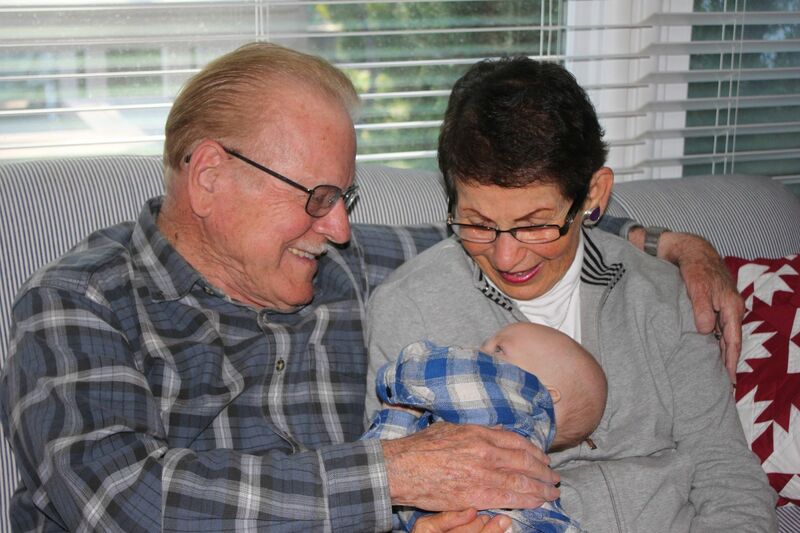 My grandparents holding a wiggly 5 month old Ronin. Marriage is wonderful and in fact there is no other person in the world that I think gets me the way my husband does. It is also a lot of work and I do not think there is ever a point where you can say you don't have to work on things anymore and everything is perfect. I recently asked my Grandparents, Meama and Poppy if I could interview them about what they believe are the secrets to a long, happy and successful marriage. They have been married forever and are both almost 90. Every time I see them together I think to myself how sweet and in love they still are after all this time. After I tried my best to explain what a blog was and that is where I would be sharing their answers (pretty sure they are still somewhat confused) they happily agreed. Now they may not be licensed experts but sometimes experience is more credible than that. Find the right partner who has the same views and beliefs as you. Do things together that you both love. "Once a week Poppy and I go on a date to Baby Cakes. We have coffee, split a cupcake and just chat." She said they both always look forward to it and talk about what cupcake they might get the night before. Be willing to do things that the other person wants even if you don't always want to do it. Be interested in the things that your partner loves. Always tell your husband how much you love him and never stop cuddling. At the end of our conversation she added, "I love him so much and truly can not live without him." This made me tear up because I know it really is true. You have to be able to understand each other. Always be respectful and do not call each other names. "If it's important to her, then it is important for us." You have to be able to give and take. After listening to them both give their individual takes on what makes a successful marriage I know for sure I learned a thing a two. This is so sweet — I agree that if it's important for one person, it's important for the couple. It's the real meaning of "us." Thanks for sharing! Great advice. My girls each had to do a project at some point in middle school where they had to interview their elders (grandparents, older parents, etc) about what marriage is. It was very interesting to read everyone's views. This made me tear. What a wonderful couple to look up to. That is so dang sweet. They have interviews once a month in our newspaper of couples who have been married more than 50 years. I love reading them. Today's our 9 year anniversary. It's crazy how much our lives have changed in less than 10 years. so beautiful. thank you for sharing this with us! I absolutely love this. Especially the cupcake date :) I wonder how long they've been doing that! I am planning a cupcake date asap! Such a sweet post. Aren't grandparents in love just the sweetest! Your grandparents are adorable and so wise! Love their commitment to marriage and all of their great tips! Your grandparents are trully inspiring..they made me realize that i should more frequently show my love to my partner which i never does,although he tries to give me every happinesss in the world..
love this post :) they are so cute! I have tears in my eyes! That is the sweetest thing ever! gosh, this is sweet!! there is no better advice, if you ask me, than the words that come from years of experience :) precious!! These values seem to have gotten lost in younger generations. Our elders believed 'til death do us part', not until I'm tired of being married to you. We are at 37 1/2 years and would still rather be together than with anyone else! 66 years for us, I have never ever regretted marrying him. I fall in love again every so often when he does or says something special........feels good.